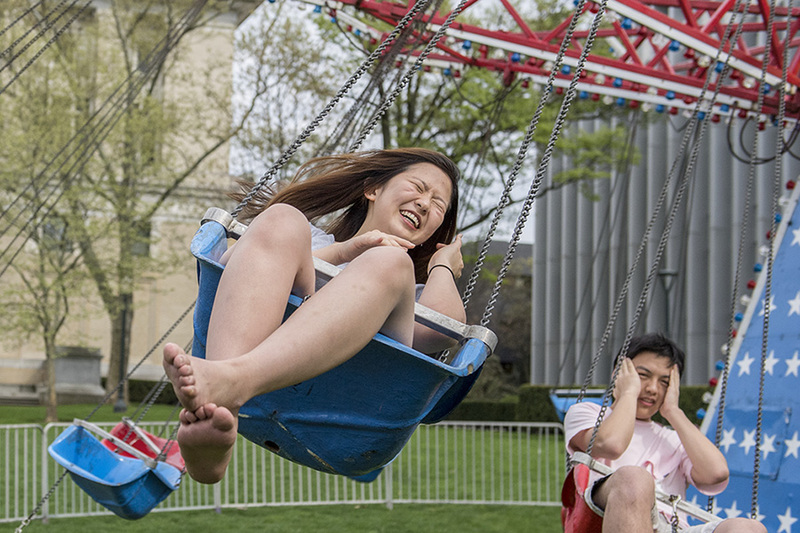 Carnegie Mellon University's annual Spring Carnival is showing how easy it is to be green and have fun with this year's theme of "Planet Earth." The opening ceremony, which will take place at 3 p.m. Thursday, April 11, on the Midway will include remarks by CMU President Farnam Jahanian, Vice President of Student Affairs and Dean of Students Gina Casalegno, and Spring Carnival Co-Chairs Hannah Koschmeder and Stephen Clark. The CMU Pipe & Drum and Kiltie bands will perform. The multi-story booths have been built around the "Planet Earth" theme and include interactive games and elaborate decorations. More than 19 student organizations have built booths, including "The Lion King," "The World Wide Web" and "The Jungle Book." A proud CMU tradition since Spring Carnival 1920, this year's Sweepstakes Buggy Races will kick off at 8 a.m. on Friday, April 12. Before the races, participating teams will display their latest designs at the Buggy Showcase from noon - 2 p.m. on Thursday in the Cohon University Center's Wiegand Gym. Amy Chen, a senior in psychology, is a driver for Fringe, which is celebrating its 50th year of racing, whose members recently talked about the Buggy experience. "Being a driver is really fun," Chen said. "I love going fast and going around the course." This year's carnival will run concurrently to Reunion Weekend, which features the 1st, 5th, 10th, 25th and 50th reunions for the undergraduate classes of 2018, 2014, 2009, 1994 and 1969. Students have stepped up activities this year to include a new ride built by students in Skibo Gym as an homage to the former Old Mill ride at Kennywood Park. "The Old Mill is a love letter to old traditional dark rides," said Roly Garcia, the project director for The Old Mill Ride and a junior information systems major. Architecture students are reaching new heights with the entrance way to Carnival. "To have this project go from an idea to an actualization is priceless," said Ghalya Alsanea, a fourth-year architecture student. "The archway was created to be sustainable. It can be disassembled and reassembled to be reused later on. The pieces can be used to create tables or chairs." The School of Architecture is honoring the achievements of retiring professors Ömer Akin and Volker Hartkopf at a 4 p.m. celebration. on Saturday, April 13. The Tartan Tuba Band will be hosting a sing-a-long as they play some of Queen's greatest hits at TuBahemian Rhapsoday at 5 p.m. on Thursday at the Midway Stage. Mobot is Carnegie Mellon's beloved abbreviation of mobile robots. This year is the 25th anniversary of the Mobot Races, in which participants race their mobots along a slalom-type course on the sidewalk in front of Wean Hall. The Mobot Races will take place at noon on Friday with the award ceremony following at 3 p.m. in Rashid Auditorium. Tents on the Midway are open to everyone and are filled with activities, demonstrations and more. In the Wellness Tent activities include pet therapy, music and massages. The activities tent will have caricature and balloon artists and Super Anthony Fighting Robots. Jimmy O. Yang with Julia Shiplett will take the stage for the sold-out Carnival Comedy Show on Thursday, and DRAM with Special Guest Vanic will perform on Saturday. Tartans Got Talent, a talent show will be back for a second year. The show will take place from 8-10:30 p.m. on Friday at the Midway Stage. Deans from CMU's Pittsburgh campus and Provost Jim Garrett will be getting soaked starting at noon on Friday, April 12 on the Cut during "Douse-a-Dean," an annual tradition that supports Special Olympics of Pennsylvania. "With the dean's ability to raise funds within their own schools and programs and the good-natured competition that's developed between the deans to see who can raise the most money, the fund raising has gone through the roof," said Lt. Joe Meyers of the Carnegie Mellon University Police Department. "Last year, the deans, by themselves, raised over $15,000 for Special Olympics." See the full schedule on the Alumni Association website or download the CMU Event app.